Home > Staying Calm > How Does Feng Shui Work? Most people have heard of Feng shui, but don’t really know about how to use it in a practical way to get the most out of their living space. Put simply, it’s the art of arranging your space to maximise health and good fortune for those living in it, and it’s a science that has its origins over 3,000 years ago in China. The word ‘Feng’ means wind and the word ‘shui’ means water. A gentle wind and clear water are associated with a good harvest and good health in ancient Chinese culture. The science revolves around balancing the energies in your living space and allowing ‘chi’ to circulate freely. 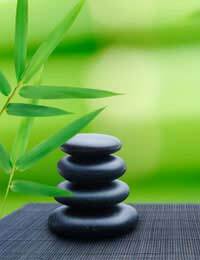 Feng Shui relies very much on the circulation of chi (air) and believes that if the chi becomes stale or its movement is blocked, it can lead to bad health and fortune. So, keep your windows open – especially in the bedroom – for at least twenty minutes every day. Don’t leave your shoes lying around close to the front and back entrance doors of your house, and always try to keep doorways clear from clutter. Avoid red sofas and chairs - the colour red is supposed to represent the fire element. A red sofa set is supposed to give you trouble, work stresses and put obstacles in your way, so is definitely best avoided if possible. Wooden furniture is better for your Feng Shui than marble, so if you’re feeling stressed, try swapping the marble kitchen or dining table for a warmer wooden one and see if that lists your chi! Also, in the kitchen area, don’t have a cooker opposite your fridge, washing machine, washbasin or toilet. Having these opposite each other cause the elements of fire and water to clash and can cause family arguments. Having a television in the bedroom is a big no-no according to Feng Shui. If you have to have a television in there, at the very least cover it up at night – preferably with a plastic cover. Don’t have a mirror opposite or at the side of your bed – they are said to attract third parties into a relationship! In a child’s bedroom, the bed should be raised off of the ground as a mattress on the floor said to contribute to sickness - the fresh chi is not able to flow underneath the bed. In the same way, bunk beds are not a good idea for Feng Shui, as the child on the bottom bunk will not have fresh chi – which according to Chinese lore will make them weak. If you have to have a bunk bed, you can fix a wind chime or crystal sphere to the bed instead to break up stale chi. Always put your bed up against a solid wall, as this can help you to get a good night’s rest. A solid wall helps encourage a deeper sleep. Feng Shui is well known for having an obsession with water and especially indoor fountains which are said to help break up stale chi and attract good luck into your home. If you have the space, put an indoor water fountain in a favourable area to attract whatever you want into your life. Make sure that any fish tanks are put in the best place, as putting one in an unfavourable position can actually bring you bad luck rather than good.Feng Shui is a complicated and involved discipline that can’t be explained in one article – if you are interested in finding out more, you can find courses in Feng Shui that will help you learn how to maximise your own living spaces – and help others to make the most of theirs too.